Sparkle? Flowers? Combine your love of both in this exquisite Large Dimensional Clear/ Pink Swarovski Crystal Narcissus Cocktail Ring In Gold Plating. This ring sparkles like no other, clad in hundreds of perfectly shaped Swarovski crystals in two different shades of pink, gradually blending into clear crystals for an incredibly unique effect. 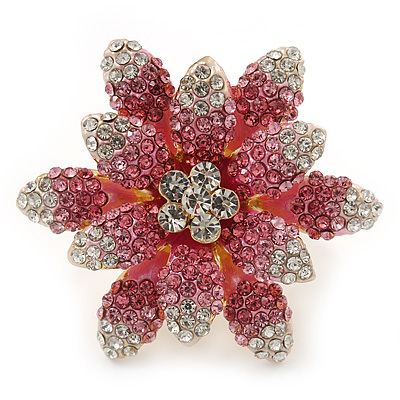 The middle of the flower is formed out of five larger clear Swarovski crystals for maximum sparkle. The station of the ring measures 40mm across, and the gold plated expandable bracket band measures 4mm in width.